Migrate data center applications to cloud without the pain, frustration and risk. Enterprise data center application migration to the public cloud can be challenging due to technical, security & compliance and workflow concerns. The challenge these organizations face is deploying self-service environments and ensuring the implementation supports all the required workflows, workloads and tools. 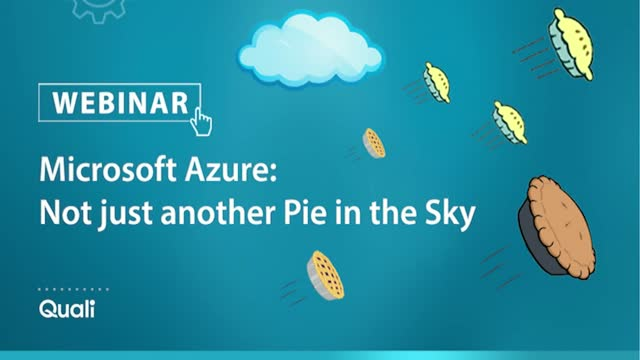 This webinar provides a step by step approach on how to address these deployment challenges for enterprise application migration to Azure Cloud using the Quali CloudShell solution. You will learn how to migrate an enterprise application within Azure using self-service cloud sandboxes. CloudShell Colony enables IT and Dev/QA teams to remove CI/CD infrastructure provisioning bottlenecks by providing a seamless workflow to deploy applications on the cloud or container infrastructure of choice. Modernizing and migrating an on-premise application to the AWS cloud can be a daunting task without the right strategy and enablement tools. The challenges that organizations face as they modernize their legacy on-premise applications include a combination of factors pertaining to technology, personnel skills and operational tools to ensure a successful application migration. application migration and enablement to the AWS cloud using the Quali CloudShell solution. You will learn how to re-platform a Drupal CMS application into AWS using self-service cloud sandboxes. Are you spending too much time prepping demos? Not enough time running killer customer demos? That’s the challenge with demoing complex technology products: they’re hard to setup. As part of its annual survey, Quali received inputs from over 1300 practitioners working in mid-to-large enterprises – all in different stages of their journey to Cloud and DevOps. We learnt about maturity of their own processes, their challenges and learnings, the barriers they’re still challenged to pull down and where they’ve made headway compared to the past couple of years. The survey, now entering into its fourth year provides a great way to look at the industry landscape over a 3-year and map it to the maturity of the transformation that enterprises are experiencing. •What are the top careabouts for enterprises in their quest for agility? Where are the existing bottlenecks? •How is the cloud strategy shaping up and what are the top automation tools? •Is DevOps adopting maturing? What are the barriers? Has the culture evolved? •How does this compare to the past 2 years? •How should you prioritize your efforts for 2018? Register now to hold the spot. Organizations in every industry face opportunities and threats caused by digitally empowered customers. Acquiring new customers — or losing existing ones — has never been easier. Companies can't afford to move fast only in some areas; the whole organization must race together toward customer obsession. Application development and delivery (AD&D) professionals must master development and operations (DevOps) and modern application delivery processes across their entire software portfolio to win in the digital marketplace. As software environments become increasingly distributed and complicated, modeling such environments authentically in the Dev/Test stage becomes critical to speed and quality. Giving timely access to such environments early on in the Dev/Test cycle, with self-service can help break silos and increase productivity allowing organizations to scale their software development and shift into higher gear – all with better governance and business insights. How do you move fast with increased agility without increasing risk? This webinar will share state-of-the-art research from Forrester including trends and best practices, and information from Quali on how to drive this with cloud sandboxes as part of the release cycle with on-demand, self-service environments. Enterprise DevOps architects, Release Management professionals, Cloud architects and professionals from ITOps are encouraged to attend. As a growing number of financial enterprises look into adopting Cloud and DevOps, environment complexity is often cited as one of the top barriers for such initiatives. Focusing on a Shift Left philosophy to deliver production-like environment access early on in the dev/test lifecycle can tremendously increase quality, cut down the cost to fix issues and, more importantly, increase innovation speed. This webinar will cover an example of using cloud sandboxes for allowing access to authentic replicas of production environments, allowing financial firms to focus on release software faster without sacrificing security and compliance. To get 400GE, NFV, and 5G wireless right the first time, your networking test lab needs to leverage innovation, reduce cost, and promote agility. Learn about the latest best practices for transforming your lab into an elastic, proactive self-service infrastructure. An increasing number of enterprises are leveraging public and hybrid clouds for their dev/test environments. With constantly changing business requirements, these environments need to be equally adaptable and dynamic. This webinar unfolds the real-world case-study of a large retail customer with over 300 software developers that were looking to increase innovation agility modeling complex and dynamic environments. They evaluated multiple vendors including home-grown platforms and finally chose the Quali CloudShell platform. The webinar will describe the requirements of the retail organization, why traditional approaches would not scale for their R&D organization and how CloudShell served as the solution to increase productivity, efficiency and speed of service delivery on the Microsoft Azure cloud. The session will also feature a demo. Environment complexity is the NUMBER TWO barrier to DevOps adoption, behind culture. It hampers developers, testers and operations professionals putting roadblocks that impact both agility and quality of releases. This webinar explores the technical and operational challenges in fast-scaling dynamic environments, while offering up new age solutions with cloud sandboxes that tackle such issues head-on. The webinar will take a use-case based approach, highlighting deployment scenarios from production customers. This Demo shows an effective and optimal way to manage and troubleshoot device failures in CloudShell Sandboxes with built in automation for both end user and the support engineer. Watch Shashi Kiran's video interview at Jenkins World 2017 and learn how Quali helps companies move to the Cloud. In this Chalkborad session, Dos Dosanjh reviews how to simplify and accelerate Financial Service Application Modernization using the Quali Cloud Sandbox solution. Hybrid clouds are important for enterprises having on-premise deployments as well as legacy applications. Likewise, multi-cloud scenarios appeal to organizations that want the flexibility to move between different clouds and not get locked-in into either one public or private clouds architecture. While over 70% of enterprises have expressed a need to deploy hybrid and/or multi-cloud architectures, as they modernize their application architectures the rollouts are complex and time consuming causing budget overruns and delays. The complexity is largely associated with the lack of common tooling, mismatched cloud architectures and expertise. These can be significantly overcome by providing access to on-demand, self-service IT environments (on-premise as well as public cloud, or a combination thereof), that would allow for more predictable application performance and security, thereby allowing for faster cloud migration and rollout, with reduced cost and risk. •How incorporating sandboxes and self-service environments in the workflow can smoothen cloud migration, hybrid deployments and the flexibility of multi-cloud deployment. Demo included. his presentation will share key insights from a survey Quali conducted of 2045 professionals to gauge the state of DevOps and Cloud adoption. It reviews the top 10 barriers to DevOps adoption as well as best practices that can help overcome these barriers. This is an informative session for DevOps and Cloud architects, application owners, technologists as well as IT infrastructure professionals that are responsible for planning and deployment of DevOps tools and processes. Are these challenges familiar to you? You're not alone: there’s hardly a day passing by without news of a security breach. Keeping abreast of the latest cyber threats and applying mitigation strategies to application environments seems to be a losing battle. In this video, we will go over a solution to rapidly construct and deconstruct your applications environments, integrate security testing tools, and harden these environments while assessing vulnerabilities before releasing to production, using a combination of award winning platforms: Quali’s CloudShell, CypherPath SDI cloud and Ixia’s Breaking Point. Using unique examples filled with humor and day to day simple anecdotes of his dog, Pushkin, Roni manages to explain in a simple language to the average person: How releases, data and PaaS services can become one repeatable, testable Sandbox. Quali is the leading automation platform delivering on-demand, self-service application and IT environments on public and private cloud. We give innovators and sales engineers control over their world by enabling them to create personalized replicas of even the most complex production environments inside of Sandboxes. We also provide DevOps teams with an efficient solution to release applications faster all the way to production. This channel covers technical webinars and webcasts offered on a monthly cadence to a technical audience. Typical topics include case study, innovative solutions and industry trends. These presentations are delivered by leading experts in the field, including product managers, senior engineers, analysts, customers and partners. Global Fortune 100 companies depend on Quali to help them deliver their products and services faster to market with better quality.